Basically, exactly what the title of this blog post says is exactly what I'm trying to say. I love it when it does exactly what is says on the tin. The F1 season has it's first Grand Prix today, in Melbourne, Australia. British driver, Lewis Hamilton has the pole position and the race is due to start at 10am but will be recorded and replayed at 7:30pm. This will be true for every race, they will be recorded and then screened at 7:30pm in the Crowne Plaza's F1 club. Oman Air, Hugo Boss, Zippo Fragrances, Marlboro, OUA, Red Bull, Pirelli and Crowne Plaza Muscat teamed up for the third year to provide an even better Formula 1 Club. Membership to the the F1 club is free, and each new member will receive a welcome pack. 2 round trip tickets to Bangkok. 2 tickets to the Abu Dhabi GP. Plus several other smaller prizes provided by the various sponsors each time. Now that's pretty cool dont you think? Personally I'd love some tickets to the Abu Dhabi GP, or Bangkok. In fact, in general I like free stuff, so it's got to be worth dropping by and watching the race there, along with other F1 fans too. Also, a public service announcement for those that need it: Today is Mothers day in the UK. Off topic but worth knowing, if you don't already know: The ground staff at the airport are or at least they were last night, on strike. They had brought in the airport cleaning staff to off load passengers luggage. So if you have a flight be sure to either ask (they are trying to keep it quiet and told staff not to tell passengers), or just take a carry on. This is great news! I'm currently evaluating a job offer in Muscat (I've just been out from the UK for a brief visit and did pop in to Duke's Bar) but am upset I wouldn't be able to watch F1 live any more. 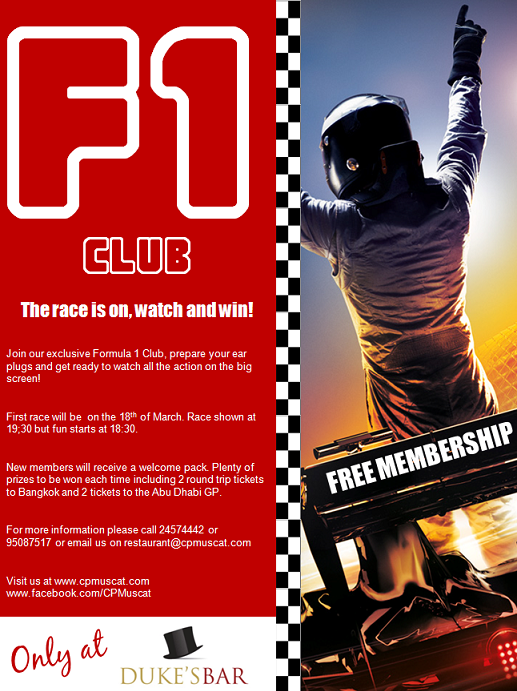 F1 Club is something I will definitely look forward to! How was your experience of the first one? Great race, obviously!